Oops, there are currently no upcoming events. Please check back later. JetX in cooperation with SolidSolutions brings a short training session on Solidworks Flow Simulation to the students of the University of Glasgow for the first time! The workshop is open to students of all levels. 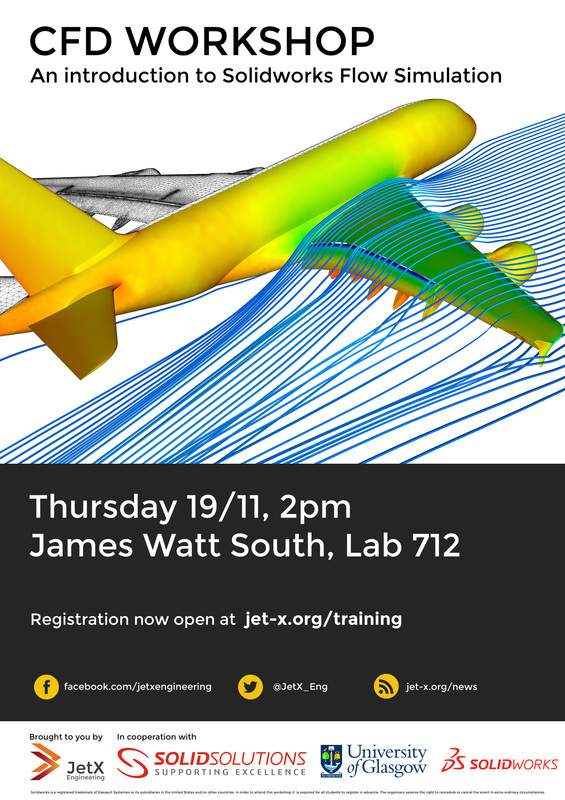 The session will take you from the very basic to demonstrating how to perform computational fluid mechanics analyses. In order to attend the workshop, you have to register following the link below. Once you get your ticket you will be redirected to our training provider's website to fill out a quick form. It is necessary that you complete both steps to register successfully. Update: The event is now full but you can still join the waitlist, following the link below. Due to extremely high demand, we will be looking to organise a second workshop, possibly early next semester. Stay up to date with us on Facebook to find out about it first!